I'm a sucker for anything chrome and was in love with OPI's Your Royal Shine-ness so when I saw the OPI x Gwen Steffani's chrome polish, I decided to give it a whirl. Called Push and Shove, the polish actually comes with a special base that allows the polish to adhere better to your nails. The polish has been getting quite a bit of flak as the special base comes in a much smaller bottle which doesn't make a whole lot of sense if the base is a necessity for the polish. I actually tried it with a regular base to see what happens and the polish went on a bit clumpy for some fingers (not all mind you) so in the end, had to stick with its base. One thing to note is that the description of the polish explicitly states it's for one night wear only as putting on a top coat dulls the shine. In an effort to make it last longer, I still layered on a top coat yet to be honest, the polish still didn't last that long. By day 2, there was already chipping and wear that I normally associate with polish that has been on for a week or so. Verdict? 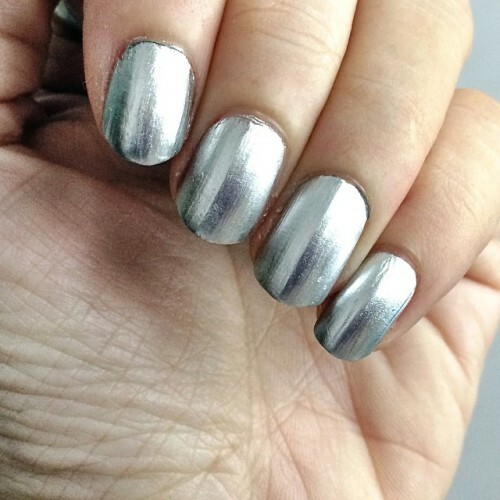 Love the chrome but I'm probably going to test it with some other colours and use this as an enhancer rather than for a full mani in the future.